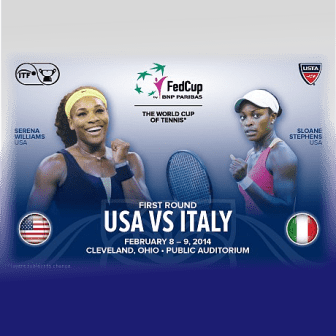 Though it wasn’t a Fed Cup Tie, more Americans advanced on Day-1 of Doha Qualifying than any other nation. Four Americans earned spots in the 2nd-Round. Madison Brengle sent Genie Bouchard packing early – while Alison Riske, Bernard Pera and Jennifer Brady all advanced, as well. 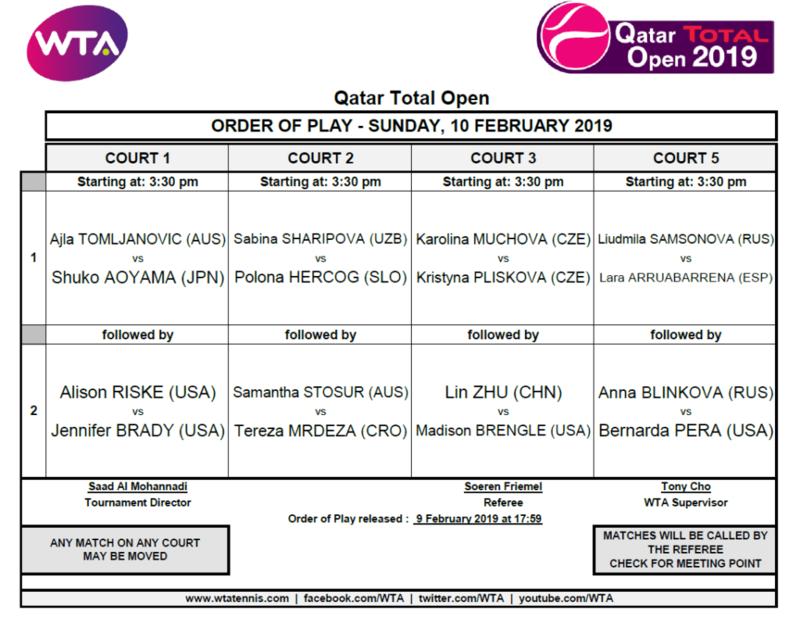 Varvara Lepchenko lost a corker to Croatia’s Tereza Mrdeza, 2-time Doha Doubles Champion Abigail Spears fell to Russia’s Sabina Sharipova, and [WC] Julia Elbaba was bested by the 7-seed Polona Hercog of Slovenia. Mubaraka al-Naimi is a great kid. Just 17-years-old, she stands alone as the future Qatari hopeful in the women’s game. Two-years-ago, at just 15, the QTF granted Mubaraka her first Qualifying Wild Card. She earned two games off veteran Kateryna Bondarenko -80- (UKR). Unfortunately, she hasn’t won a single game here in Doha since. Last year, Cici Bellis shut her out. This year, it was Karolina Muchova’s turn. With more exposure to global ITF events and a boost from her local Federation every February, the hope is al-Naimi will gain the confidence and experience to become a contender at the Tour level. Meanwhile, Karolina Muchova is on the climb. Last Summer, the 22-year-old reached the main draw of a Major for the first time at the US Open, and couldn’t stop winning. In Round-2, she earned the biggest win of her career, knocking-off 2-time Grand Slam Champion Garbine Muguruza -12- (ESP), before falling to Ashleigh Barty -17- (AUS) in Round-3. She started 2019 with a career-high ranking of World #130, then qualified for the Australian Open for the first time. She looks to continue her run of good fortune with another pair of qualifying wins and run deep in the Doha draw next week. Qualifying’s 8-seed, Kristyna Pliskova wasted no time against against Hao-Ching Chan. The two are quite familiar with each other, considering their doubles pedigrees. Kristyna owns three doubles titles with twin sister Karolina – 2017 Doha Singles Champion. Hao-Ching and older sister Latisha (Yung-Jan) just won their 9th title together in Hobart. In 2016, the tandem captured the Doha Doubles title with a win over Sara Errani and Carla Suarez Navarro. While Kristyna has focused most of her attention on singles, Saturday’s clash was Hao-Ching’s first singles match since a Qualifying loss in Stanford back in 2017. Now the World #20 in Doubles with 15 career titles, the 25-year-old has yet to win a Tour-level Singles match. Delaware’s Madison Brengle is on the rise. The former World #35 reached four Finals on the ITF circuit last year. She won three of them. The 28-year-old is on the hunt to regain promising form displayed at the start of the 2015 season. That year, she started her campaign with a Round of 16 run in Brisbane, reached her first WTA Tour-level Final in Hobart, and at the Australian Open – made her Round of 16 debut at a Major. In her fourth career stand-off with former World #5 Genie Bouchard, Brengle was simply the fitter athlete. It was deciding-set redemption for Madison, after Bouchard’s 63 63 walk-off victory last month in Auckland’s 1st-Round. Needless to say, a Round-1 Qualifying exit is a tough one to swallow for Bouchard. The 24-year-old Canuck has been making serious progress since nearly dropping out of the top-200 last June. She is a 7-time Grand Slam Champion. Sam Stosur won her first Major at the 2005 Australian Open, capturing the Mixed Doubles title with Scott Draper. Later that year, she won her second Slam at the 2005 US Open, earning the Doubles title with Lisa Raymond. Since then, she won the US Open Singles title, reached the French Open Singles Final, won 2 additional Grand Slam Mixed Doubles titles – and last month, captured her 3rd Doubles Major at the Australian Open; her 13th Grand Slam Championship Final. Sam’s unmatched work-ethic has bred longevity through durability, but Father Time is Father Time. After finishing four straight seasons in the top-10 – since 2014, that year-end ranking has been fading. She comes into this year’s Qatar Total Open as the World #73 and owns only one Singles victory since week-1: A 1st-Round win over Dominika Cibulkova -26- (SVK) in Sydney. On Saturday, she had little trouble with last-minute Qualifier Shilin Xu of China. Winning can be infectious for streaky Slovenian Polona Hercog. Last year, she started the season as the World #100, reached her 5th career Tour-level Final in Istanbul, then went 4-7 before reaching the Semifinals in Bucharest. She climbed as high as World #58, only to drop back to the high 80’s toward the end of the year. Tennis is a heady game. Here in Doha, she’s off to a good Qualifying start – dropping only 4-games to Lebanese/American Julia Elbaba. Currently the World #526, it’s fortunate Wild Card appearances like this one that can only help 24-year-old Elbaba continue to develop her game on the ITF circuit. Columbia’s Mariana Ramirez Nieto is just 16-years-old. Securing a Qualifying Wild Card to play in Doha is a huge “next step.” Oddly enough, she was tasked with taking-on a 26-year-old veteran whose greatest Tour success has come in Bogota. Nashville’s Allie Risk continues to win. During week-1 of the season, she won 4 straight in Shenzhen to reach her 7th career WTA Final. After a tough 1st-Round draw at the Australian Open – falling to  Kiki Bertens -09- (NED) 36 36 – Riske is looking to make an impact during her Doha debut. 20-year-old Anna Kalinskaya’s had a great start to the season, as well. In week-1, she won her 6th title on the ITF circuit, then went on the qualify for the Australian Open for the second year in-a-row. In St. Petersburg, she reached her first career WTA Tour-level Doubles Final with parter Viktoria Kuzmova. Alison Riske may have been too good for the Russian today, but Kalinskaya is a “trending topic.” Expect to hear her name more often as we head through the rest of the season. 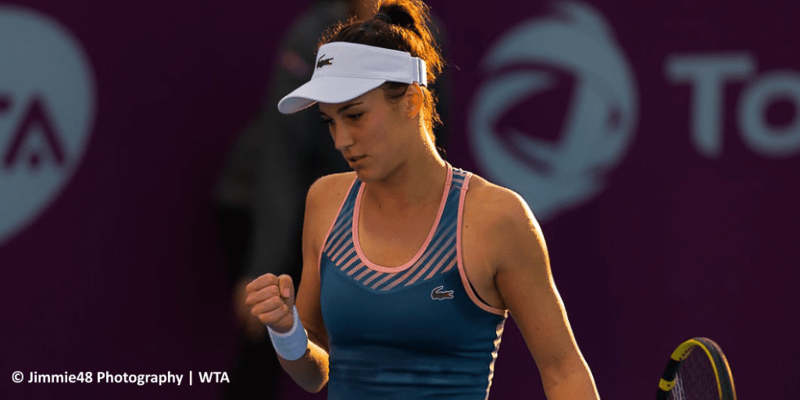 In 2018, American Bernarda Pera started the season as the World #128. She quickly became the talk of Melbourne. As a lucky loser, she made her Grand Slam main draw debut, and crushed it. After a win over Anna Blinkova, she upset World #10 Jo Konta to reach the 3rd-Round – Jo got her revenge a month later here in Doha. Pera enjoyed a career-best season, capped with a Semifinal run in Guangzhou and a career-high ranking of World #67. This year hasn’t been as kind. With only a single qualifying victory since week-1, she’s determined to make the Qatar Total Open her 2019 turning point. A victory over Veronika Kudermetova is a step in the right direction. The 21-year-old Russian comes into Doha after cracking the WTA’s top-100 for the first time. She’s won 10 matches since week-1 – 7 qualifiers, 3 in main draw play. She reached the Quarterfinals in Shenzhen, made her Grand Slam main draw debut at the Australian Open – and last week, reached the Round of 16 in St. Petersburg. Tougth loss for Kudermetova. Big win for Pera. 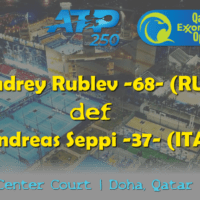 For the first time, Romania’s Sorana Cirstea had to Qualify in Doha. A Round-2 regular, last year she upset  Elise Mertens -20- to reach the Round of 16. But after capturing the first set on Saturday, Sorana disappearaed. 31-year-old Shuko Aoyama – the World #45 in Doubles – earned her first Tour-level Qualifying victory in over a year. In early 2018, she reached Round-2 of Qualifying in Sydney after Annett Kontaveit retired down 0-3 in the third. It took Lin Zhu a set to wake-up on Saturday. After a dominant set-2, the 25-year-old from China earned her second career win over Dulgheru in the decider. Last month, Zhu won her 8th title on the ITF circuit – shortly after qualifying at the Australian Open for the 3rd consecutive year. She’s been knocking on the top-100’s door for three years now. A solid run in Doha could deliver that goal…but first, she has to get through qualifying. 29-year-old Alexandra Dulgheru is a fomer top-30 talent. She hasn’t been near those heights in nearly 8-years, but her passion for the sport keeps her on the road testing talent at the ITF level. 4-years-ago in Doha, she upset World #24 Alize Cornet to reach the Round of 16 for the first time. This year, she’ll have to settle on a run in Doubles. Big win for the World #202, after losing the first 5-7 in a tiebreak. Tereza is a 28-year-old veteran of the ITF Circuit. She owns 6 career ITF Singles titles in 16 Finals, but she has struggled to replicate that success at the WTA Tour level. She’s some success on clay at her home 125k-Series event in Bol (R16-2017, QF-2016), but her best “Tour-level” performance came at the 2015 US Open. There, she won three qualifying matches and reached the main draw of a Major for the first (and only) time. You know Varvara will be kicking herself after snatching set-1 in a tiebreak. Since week-1 of 2019, the 32-year-old former World #19 has only won three qualifying matches at the Australian Open. Unranked in singles, 37-year-old Abigail Spears is a 2-time Doha Doubles Champion. Like top doubles players Hao-Ching Chan and Shuko Aoyama, she stepped-in when other Qualifiers bailed just before the start of the tournament (mainly due to Fed Cup commitments). 24-year-old Ukrainian Sabina Sharipova has been putting up big numbers. A 5-time Finalist on the ITF circuit last year, she captured three titles and climbed to a career-high ranking of World #122. She quickly foiled Abigail’s rare singles appearance. You have to go back to September of 2014 to find Spears’ last singles victory: A Round-1 Qualifying win over Yurika Sema -319- (JPN). Award the day’s biggest upset to Russia’s Liudmila Samsonova. The 20-year-old derailed Tamara Zidansek’s forward momentum since week-1, which included her first Grand Slam main draw victory at the Australian Open, and a run to the Thailand Open Semifinals. Samsonova played only ITF events last year, winning 2 titles in 4 Finals. She made her WTA Tour-level debut just last week in St. Petersburg, where she fell in the 2nd-Round of Qualifying. A win tomorrow would be the Russian’s best WTA level result to date. Stay tuned. Harrisburg, Pennsylvania’s Jennifer Brady is still basking in the glow of her top-20 win last week. At the Taiwan Open, the 23-year-old upset [2/WC] Caroline Garcia -19- after a pair of qualifying victories. It was a gratifying win after falling in Round-1 of Qualifying in Brisbane and in the Final Round of Qualifying at the Australian Open. 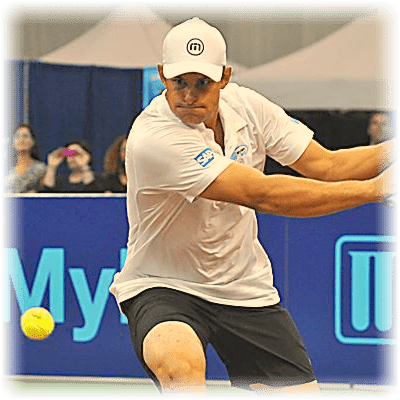 The UCLA Bruin owns 4 ITF Singles titles, 4 ITF Doubles titles, and has been ranked as high as World #60. She’s on the hunt to make an impact in her Doha debut. 22-year-old Anhelina Kalinina opened the season with her first Tour-level Doubles Semifinal. The Ukrainian teamed veteran Nao Hibino to reach the Final-4 in Shenzhen. Doha marks four straight events where she’s failed to Qualify in Singles. With 9 ITF Titles, including 3 last year, it’s just a matter of time before the 2014 Australian Open Junior Doubles Champion breaks through on the Tour level. At the US Open last August, she reached the main draw of a Major for the first time, defeated Liechtenstein’s Kathinka Von Deichman in Round-1, then fell to defending champion  Sloane Stephens -03- (USA). Last year, at just 19-years-old, Russia’s Anna Blinkova was a determined machine. She started 2018 outside the top-100, but qualified for every tournament she entered in the first 7-weeks – including the Qatar Total Open. At the time, she was the World #164. Not only did she qualify, she upset both  Kristina Mladenovic -13- (FRA) and Elena Vesnina -23- (RUS) to reach the Final-16. Peppering her season with an even mix of deep ITF-level runs and WTA-level events, she broke into the top-100 before season’s end. While this year hasn’t been as dynamic, Anna did earn a significant Round-1 win over  Shuai Zhang -40- (CHN) in Hobart. After early exits in Melbourne and Thailand, she’s excited to be back at an event that rewarded her subdued tenacity last year. Her opponent, 34-year-old Brit Emily Webley-Smith could only manage 3-games against a challenger 14-years her junior. The Wild Card opportunity was a significant one for Webley – happy to get some court time against the best in the game. Hopefully we’ll see more of the veteran. Last year, she reached her 8th ITF Singles Final in India, and captured two ITF Doubles titles in three Finals – making her a 42-time ITF Circuit Doubles Finalist.